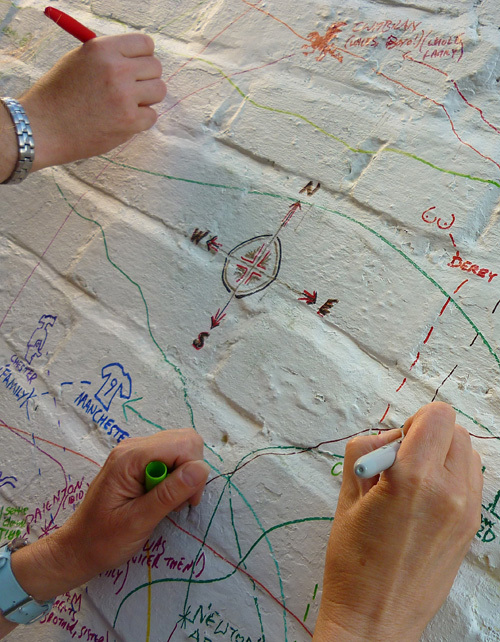 In 2011, I initiated Where Are You From, Totnes?, a participatory arts project engaging residents of Totnes, England in creative dialogues about where we came from, what being there meant to us, and where we hoped to go. Globe Garden, the backyard of the cottage where I lived, became an interactive space for Totnesians to express identity in relation to location and each other. Recording conversations, mapping roots, and emplacing belongings, we devised an accumulative archive of interactions between people and place. After three inspiring weeks of open workshops, we presented the collected stories, hopes and concerns of our community in a performance and interactive installation open to the public during the Totnes Festival. This project was supported by Arts Council England as well as Transition Town Network and facilitated in collaboration with socially-engaged artists Ria Hartley and Lisa Evans.